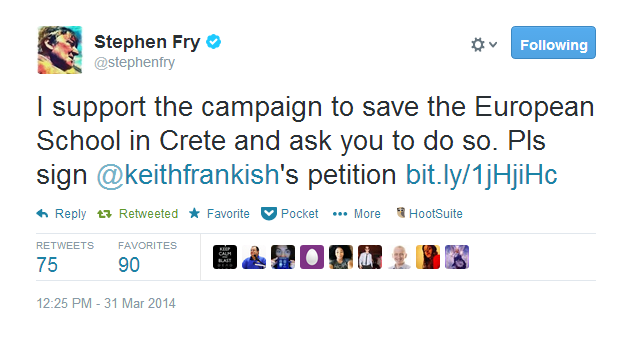 Stephen Fry has tweeted his support for our campaign to save the SEEH. Thank you, Stephen! You can help support us by changing your profile picture on social media sites to the one below until 8 April. Every little helps! A student of the School of European Education Heraklion Crete appeals to the Greek Minister of Education to save his school. We can all help him do it. Our last meeting at the school was a wonderfully warm and supportive one. All of us -- parents, teachers, and ENISA – were united and spoke with one voice to support the future of our school, the future of our kids, the future of Greece in Europe. Maria Kasmirli is a class teacher at the SEEH and parent to three SEEH pupils. Iraklio Live has a report on our campaign (in Greek but your browser may offer a translation). The minister also has a personal facebook page, where you can post messages. 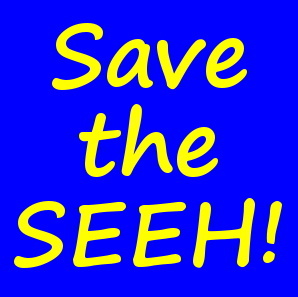 If you would like to know more about the SEEH and the background to the current crisis for the school, please see this blog post by Maria Kasmirli. "The SEE is great because children from other countries who do not know Greek go there and still have lessons in their own language." Our petition to the Greek Education Minister opened on Friday 28 March, and by Saturday night it had reached 750 signatures. This is great news and we are very grateful to everyone who has supported us. But we need to press on and get more signatures if we are present a compelling case to the Minister before our 8 April deadline. So if you haven't signed, please do so, and if you have, please share the link with your friends.